Steemit is a blogging social that you should be using. It is a great promotional tool for your own blog. And if you set up your blog SEO correctly you will get great results. Steemit blog posts index incredibly quickly and rank on the Google SERPs. And the faster your marketing pages can get indexed and ranked the faster your main blog pages get indexed and ranked. Steemit is not WordPress. You don’t have an HTML editor to create your articles so you are limited in what you can do. It works with and uses markdown code, which can be a bit tricky, to begin with, but once you get the hang of it, you won’t the process that complicated. The permalink of all Steemit blog articles is taken from the article title. 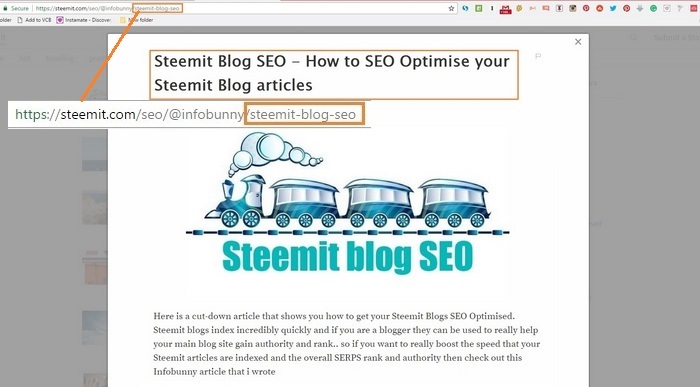 So if you have a title like “Steemit Blog Seo – How to optimise your Steemit Blogs” then that will be the base of your link. Now, this is not a bad thing when it comes to Steemit Blog SEO or in fact SEO in general. But what It does give you is very long page links. This is not always very wise when your link is full of stop words. A better SEO solution would be to have a shorter, more direct keyword based permalink. The BAD NEWS is you can’t edit the permalink on Steemit like you can on WordPress. But what you can do is edit Steemit blog articles that you create. Let’s think about this for a second. Is there a way to get a shorter keyword based permalink link? And the answer is yes. The permalink of any Quora blog page that you create is defined by the title of the post. So if you create a post titled Quora Blog SEO – How to SEO optimise Quora Blogs then that phrase becomes the permalink. Unfortunately you can’t edit the permalink like you can on WordPress so think long and hard about your title. So the solution to a shorter keyword based permalink is to create a short article title and save. This locks in your short permalink. You then edit your article and change the title to a more long tail keyword based title. I love using Blockquote on articles. You can see I have used it in this article for the snippet from the Quora article. Blockquote just makes what you post look that bit more professional if used in the correct situation. Use your main keywords in the first 160 characters of your post. Let Google know what your article is about as quickly as possible. Then use variants and secondary keywords throughout the body of the post. Don’t be afraid to link out to articles and information that is an authority on your niche subject. Google is all about putting the most relevant information in front of someone. 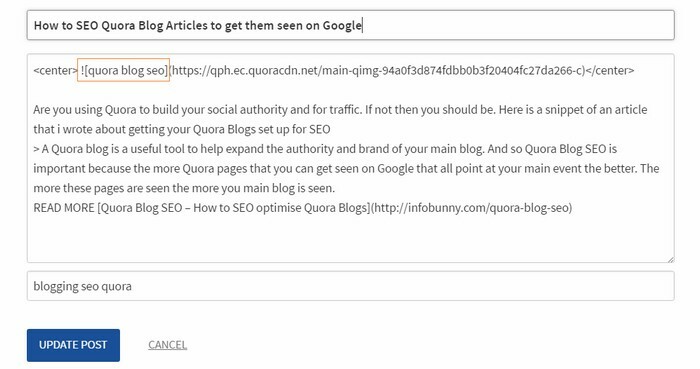 By linking to authority sites you give signals to Google that your article is related. Your Meta Description is taken from the first 160 characters of your article. This is the text that shows up under the article title on the SERPs. So get your keywords in there and make this description as interesting as possible. You want to get visitors to click through. You could even work the article so that you have a call to action or a question type statement as a subheading right at the top and then you go into the article. So, in other words, add in a meta description type intro then the body of the article. It goes without saying that once you have published you share your new post to all your social channels. WordPress has a ping service withing the platform. Steemit doesn’t have this so head over to any ping service and just ping your article out. Some real great advise especially the links to authorities is a great idea I have not used yet! Thanks for that! Well the first thing is I just came to know about steemit blog from this post itself and I think its really wonderful platform. I’m going to signup there now. I just read a seperate post on this exact topic. To fully optimize any post, yes you want to focus on the basic SEO items like H tags, Titles and setting up your permalinks the way you want. Outside of that you want to focus more on user intent and picking keywords or phrases that have a high click through rate. 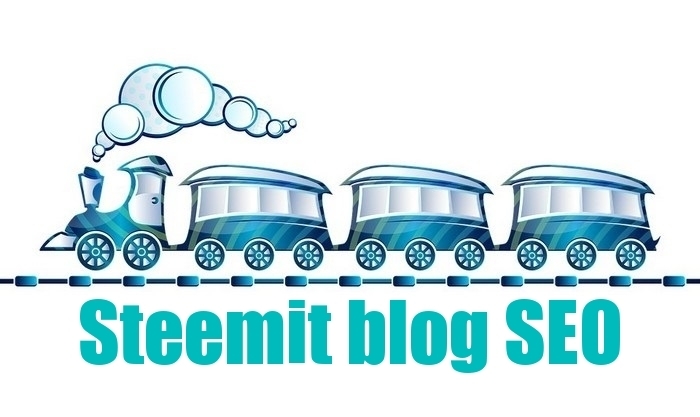 Nice article, Steemit blogs is a great promotional tool for the blog.